Saturday was the fourth day of the International UFO Congress in Fountain Hills, Arizona, the largest UFO conference in the world. My previous Blog posting covers the third day. Here is a link back to the first posting about the conference. The first speaker on Saturday morning was Ben McGee, speaking on "Galactic Deep Time, Xenoarchaeology, and the case for Physical Artifacts as 'First Contact.'" He is best known as the skeptic guy on National Geographic Channel's dreadful Chasing UFOs which, I am happy to report, will not be renewed for another season. He has his own spaceflight consulting company. He began by noting that at present, we can only scientifically demonstrate one kind of life: that of earth. But 'extremophile' life abounds on earth, suggesting that life can exist in a wide range of conditions. He described the history of life on earth in terms of "galactic years," the time required for one full rotation of our galaxy (220 million years). Hence "deep time" is important to think about in terms of the prevalence of ETI. Earth has had five major extinction events in the last 2.5 galactic years, and two within the last G.Y. So how long would a civilization last in our galaxy? L, or lifetime, is a term in the famous Drake Equation for estimating ETI, and choosing a longer or shorter value drastically alters the result. Isaac Asimov estimated, using the Drake Equation, that there are only 10 planets in our galaxy now that have advanced civilizations. If drastic extinction events are common, then an estimated 325 million planets would contain not an actual civilization, but the ruins of one. Hence, Xenoarchaeology, the study of artifacts from extraterrestrial civilizations, which would require different methods than conventional archaeology. He did not explain how we are supposed to get to the places where Xenoarchaeology will be performed, although we may possibly encounter such artifacts in our own solar system, the remains of ancient visitations. Later in the day I had a chance to speak with Ben (we had already been in contact by email). A woman was excitedly telling him about supposed "orbs" that appear in some of her photos, and he explained to her, with infinite patience, how this was the result of close-up dust particles in the air being illuminated by the flash. I semi-apologized to him for having to write such unkind things about the National Geographic's Chasing UFOs (as did nearly everyone else). He said he was disappointed in the show, too. The show was originally presented to them as a 'sightings investigation' type of program, but different producers took over and made it into a 'ghost hunters' type of loopy action show. I asked him what was he working on now, and he told me about a new series on the Weather Channel called "Forecasting the end," which premieres March 21. It deals with issues in geology, astronomy, and radiation science. It should be interesting. The next speaker was the documentary film director James Fox, who also was one of the regulars on Chasing UFOs (he was "the believer," to Ben's "skeptic.") He describes his work as a UFO documentary film producer (Out of the Blue, I Know What I Saw) as promoting the fulfillment of the public's "right to know" what is going on. "If we can get Michael Shermer to agree that 'structured craft' are real, then we're getting somewhere." This apparently refers to Shermer's unfortunate endorsement of Out Of The Blue as "one of the very best films ever produced on this, one of the most interesting subjects in the history of science." I beg to disagree: it is a totally one-sided Crockumentary. Fox spent a great deal of time talking about and illustrating the news coverage that he has received, and he showed some examples of his "gorilla marketing" of his films (I suspect he meant "guerilla"). Fox explained that he had arranged to interview Buzz Aldrin about the UFOs that supposedly followed him to the moon, but Aldrin backed out at the last minute because he feared losing funding from Paul Allen for SETI. Here is a YouTube video where Fox makes this same claim. I did not realize that former Arizona governor Fife Symington's belated confession that he, too, saw the big V-shaped UFO of the Phoenix lights, ten years after the fact, was made while Fox was interviewing him. Later I had an opportunity to talk to Fox, and told him that there is good reason to believe that Symington is lying about his me-too sighting. (Symington was, after all, convicted on seven felony counts of fraud, overturned on a technicality, then pardoned by the outgoing President Clinton.) The first UFO event of the evening, the V-shaped lights (actually five Air National Guard A-10s flying in formation from Las Vegas to Tucson; Tim Printy has more about this) occurred from just before 8:00 PM until 8:45. The second event, that Fox agreed was a flare drop from different Air National Guard planes, began at 10:00 and lasted at most ten minutes. I reminded Fox that Symington claimed to have seen news coverage of the lights on TV, then went outside to look. He says he walked down to where the news crews had been filming the lights (the flare drop), and then saw the V-shape fly over, big and mysterious. However, there was no news coverage of the sightings before the planes landed about 8:45, and there could have been nobody filming the "lights" prior to 10:00, because the flares had not yet been dropped. Therefore Symington's claimed sighting occurred after 10:00, probably well after, and hence is an obvious fabrication. "No, he saw it at 8:20. It was 8:20," Fox insisted. "How could he have seen news coverage of this by 8:20? ", I asked. "Maybe he heard chatter on the radio or something," Fox said. "How could there have been news crews filming this by 8:20? ", I asked? Fox was having no more of this conversation. "Why would Symington have made this up? ", another man asked me. "Because of the news coverage it gave him, and feature stories in which he talks about his new business ventures. It would have cost a lot to buy the publicity he got for free by claiming a UFO sighting." Fox announced that his next UFO Crockumentary project was under way: 701 - The Movie. This, he says, is the number that the government does not want you to know - the number of Blue Book "unknowns." What Fox does not realize is that this number has already shrunk upon further analysis, and is set to shrink still further (see Tim Printy's Sunlite for more details). The next speaker was the inevitable Stanton T. Friedman, who promised "A New Look at the Cosmos," although very little in his talk was new. The rate of change in his presentation, if any, is glacial. He began talking about scientific mistakes of the past. To Friedman, rejecting UFOs is another of science's great mistakes. He presented the equations of fusion, without working out the actual results of those equations as did Dr. Edward M. Purcell, proving that interstellar travel using nuclear fusion is preposterous. He termed SETI the "silly effort to investigate." After all, why look all across the cosmos for ETI when they're here right now? Friedman says that as part of a program on a cruise ship he debated two skeptics on the subject of UFOs. Against Seth Shostak, he claims he won the debate according to 58% of the audience, and against Michael Shermer by 80%. People say that if the government had UFO secrets, they would have leaked out by now. Freidman claims that governments can keep secrets, and for his example he cites the Corona spy satellite program of the early 1960s, that supposedly was unknown until it was declassified in 1995. BZZZZT! Wrong-o, Stanton. In 1971 your good buddy Philip J. Klass, drawing upon what he learned in his work as Senior Avionics Editor at Aviation Leak magazine, wrote Secret Sentries in Space (Random House), which contains a detailed description of the then top-secret classified Corona program, explaining exactly what it is and how it works. Aviation Week magazine was the original Wikileaks. Klass always insisted that, if there were any government secrets about UFOs, he would have picked up on them long ago through his extensive network of sources. Friedman says that at least three out of over 100 supposedly leaked MJ-12 government UFO documents are authentic, meaning he concedes that some energetic hoaxer has produced the other 97%. I say it's 100%. We almost agree. Interestingly, Friedman did not mention the Fish Map (a supposed extraterrestrial star map sketched by Betty Hill), but did go on about Zeta1 and Zeta2 Reticuli, the supposed home stars of the UFOnauts, according to that map. It was good to see that he seems to have finally capitulated to the facts, and abandoned, at least in part, the famous Fish Map. However, for reasons that make no sense, he still clings to Zeta1 and Zeta2 as stars allegedly being the home base of the UFOnauts. Of course, once you concede that the Fish Map pattern means nothing, then the Zetas mean nothing, as well. So we should applaud Friedman for having taken little baby steps in the direction of truth. Not surprisingly, in view of the above Friedman was not exactly happy to see me. Here is more bad news for Friedman from astronomers: Far-infrared observations have revealed "A flattened, disk-like structure with a semi-major axis of~ 100 AU in size is detected around zeta^2 Ret. The resolved structure suggests the presence of an eccentric dust ring, which we interpret as an exo-Kuiper belt." Which suggests that there are no planets around Zeta2, or they would have swept away this dust ring through constant collisions with its particles. But wait, there's more: Zeta 1 and Zeta 2 are not Main Sequence stars at all, but sub-dwarf stars, Class VI (Main Sequence stars are Class V). The Fish Map was supposed to exclude all non Main Sequence stars. If you don't understand all these terms, don't worry. It just means that the two Zetas are not really solar-type stars, and should have been excluded from the Fish Map. Goodbye, Zeta Reticuli. The next talk, by Alain Boudier, was potentially the most significant and newsworthy of the entire Congress. It is the only one that promises genuinely new and historically significant information. Boudier said that the 3AF is the most prestigious organization of its kind in France. It is an aerospace organization, not a government body, equivalent to the American AIAA (which had its own flirtation wqith UFOs over forty years ago, and thankfully not since). The UFO report of the 3AF Sigma Commission is set to be released in a few months. Until then, he said, he cannot discuss it, and then he proceeded to do just that. This report, he promised, will be different than the “official” history of UFOs. It appears that the intent of the report is to push the entire UFO chronology back, before Arnold, to include the World War II era. He talked about foo fighters, the Battle of Los Angeles, and some pre-Arnold sightings in the Pacific before moving on to Roswell, which he accepts as a genuine alien crash. The report’s conclusions were that the U.S. military made its first UFO crash retrievals in 1941 (by the Navy, off the coast of San Deigo), and on Feb. 26, 1942 (by the Army, in the San Bernardino mountains). Supposedly a document from FDR mentions the retrievals. The U.S. formed an “Interplanetary Phenomena Unit” to manage these retrievals. This allowed the development of otherwise-unknown technology, which he suggested was used to defeat Japan. You heard it right, folks: reverse-engineered alien technology was used to build the atomic bomb. A lot of people at the conference seem to have missed this bombshell announcement. Boudier was speaking in French, with Antonio Huneeus translating (who did extremely well considering that his native language was neither French nor English, but Spanish). Still, with the inevitable delays the talk was difficult to listen to, and many people left the auditorium. Based on what Boudier told us, when the 3AF UFO report is finally released, the 3AF will no longer be considered “prestigious,” but a laughingstock. The final speaker of Saturday was David Hatcher Childress, whose talk was titled “Tesla, UFOs, and Atlantean Technology.” He was described as a “co-star” of Ancient Aliens on the History Channel, and a “real-life Indiana Jones.” It looked to me like he had the biggest audience of any speaker, which tells you a lot about who is attending this conference. He started talking about the ancients’ apparent levitation of heavy stones, and the use of power tools. At this point I left, having heard such stuff many times before on Ancient Aliens. I didn’t stay to find out if Tesla stole his discoveries from the Atlanteans, or vice versa. As far as the Phoenix lights "incident", I saw people interviewed who saw it right above their heads as it flew over their yards and houses. They all gave pretty similar descriptions. Were they lying? I can tell you love what you do and it's kinda funny how you bask in it. Have fun! If you read all the reports, you will discover that a lot of these people made their reports months later. However, an analysis of the NUFORC database (esp the early reports) indicates only about 1/3rd of these individuals saw this. Many others just reported formations of lights. I discuss this and many other things about the sighting in SUNlite 2-3 and my website on the subject. Robert, you are correct about Symmington's story. He proclaimed (on the record) it was announced on the television (not radio) and then went looking for the UFO. "I was up in the sunny slope area around 8:00 at night. And I went out to look to the west where the -- all the news channels were filming the Phoenix Lights. And to my astonishment this large sort of delta-shaped, wedge-shaped, craft moved silently over the valley, over Squall Peak, dramatically large, very distinctive leading edge with some enormous lights. And it just went on down to the Southeast Valley. And I was absolutely stunned because I was turning to the west looking for the distant Phoenix Lights and all of a sudden this apparition appears." Of course, the Phoenix Lights (flares) were not dropped until 10 PM, so nobody was filming anything at 8 PM. And if it was late enough for the news crews to be filming the flare drop, the 'giant V' was long gone. The location given there was Sumida Park. What he is describing is having dinner, watching TV and hearing about the UFO. He then took 5 or so minutes to get in his car and drive to this location (it may have been longer but I am generous). Then we have an additional five minutes until the UFO appeared. That is a ten minute lag between being aware and then seeing the UFO. The first reports in Prescott were around 8:15 PM (according to NUFORC). Most of the witnesses (including the never mentioned/ignored Mitch Stanley) in the Phoenix area saw it between 8:20 and 8:40. Compare this to all the other individuals who saw the event. They were all surprised by it. They had no forewarning. The media could not have broadcasted alerts on TV (for that matter on the radio since nobody else seemed to be aware of this -even those in cars!). Why should I believe Symmington is telling the truth here. I wonder if anybody ever checked to see if the governor was even home that night. Who knows, he may have been at a fund raiser or working late. Inquiring minds would want to know that. Still, that 1/3 group of people saw something that cannot be explained. But 2/3rds did not see it that way. The video of the V confirms this when we see a significantly changing pattern of lights in less than a minute. This would not happen if they were attached to a fixed craft as these minority witnesses state. There is, perhaps, an interesting avenue of study within the throngs of UFO believers, in the belief that we are apparently much stupider than we credit ourselves - every significant accomplishment was actually alien technology. Aliens, apparently, thought it was important and useful in helping us build giant pyramidal tombs, and now instead of taking their technology and producing fantastic new propulsion systems, we instead created the very atomic weapons that they warned us (throughout the cold war) not to build. I'm curious. When we stole the technology, did we steal the plutonium gun design, or the implosion shell design? Because neither one was built very directly. Or was it the actual theory of atomic fission that was developed over four decades by people in twelve different countries? You're only showing the "goofballs" in this comment. There are many, many others who would laugh and scoff at a list like that, yet still believe that UFOs in fact do exist. A good overview. I will say supposedly (Marden in an PM) Friedman was never a huge fan of the Fish map, but Betty liked it. The elusive break between Betty and Marjorie Fish is still a mystery. I love this whole "any day now" feel of the UFO conference. It goes well with the "any day now" we'll find bigfoot. I was glad to hear Ben McGee was unhappy with the horrible Nat Geo show. It was unbearable to watch, and I can even suffer through "Finding Bigfoot". I don't think people "lie" about seeing a UFO, or say a strange formation of lights. They think they've seen something (and why that something has to be from a planet far away always confuses me), memories are not photographic (though Kathleen Marden asserts that Betty Hill had a photographic memory, which is why she remembers everything so well for her "abduction"). People are unfamiliar with the night sky, for the most part, and so mistake many things most amateur astronomers shrug off as familiar, for "UFOs". I look forward to the French showing us all how UFOs and such are real and proven. Just nudge me awake when this happens. Thanks for the great reporting as usual. Tim, next year we need to make this event so Robert isn't too lonely. When shows like the ones mentioned above are produced, it is always likely that the participants are really not on board with producers and writers, etc. The chances of seeing a sasquatch or a ufo on production day, especially with a team of cameras, sound guys, producers, directors and other crew, are astronomical at best. I don't know about "unbearable", but frustrating comes to mind. Still, I'd rather watch these shows than most all of the "reality" shows out there. I'll learn something, even if it's only a little. I will never claim to know everything, as many skeptics and ufo believers alike seem to contend. I really wish I could make one of these conferences. Unfortunately, work, family, and other issues keep me away. Flying cross-country for a UFO conference (even a skeptic conference) just isn't in the cards these days. One day, in the not so distant future, I hope to be able to make such trips. Love the skepticism, but there will always remain the unexplained sightings....until something breaks. Put it this way. There's no way anyone can honestly say that ufos or bigfoot for that matter definitely do not exist. "Unicorns From Outer Space" do not exist. "There's no way anyone can honestly say that ufos or bigfoot for that matter definitely do not exist." As Zoam demonstrates, it's actually very easy to do. What you were hoping to convey is that there is no logical process behind it, which is true. However, such a statement being illogical does not make it wrong, either. It's illogical to say that Tikowafflers don't exist, but since I just made that word up right now it's also perfectly correct - logic does not rule over reality. The only value comes from demonstrating existence, not from taking refuge in semantics. And despite the avalanche of straw men in the topic, that's what most skeptics are highlighting: that the evidence is lacking. If logic is considered important, then the very least anyone can do is debate the actual points raised. You just used logic to prove the possible validity of the illogical. You say "the evidence [of extraterrestrial visitations of Earth] is lacking." That depends on one's criteria for what constitutes "evidence." And that's where logic comes in again. You can't escape logic in these kinds of discussions. Ross: "You can't escape logic in these kinds of discussions." You can, however, be entirely mistaken as to what it is. "That depends on one's criteria for what constitutes 'evidence.' 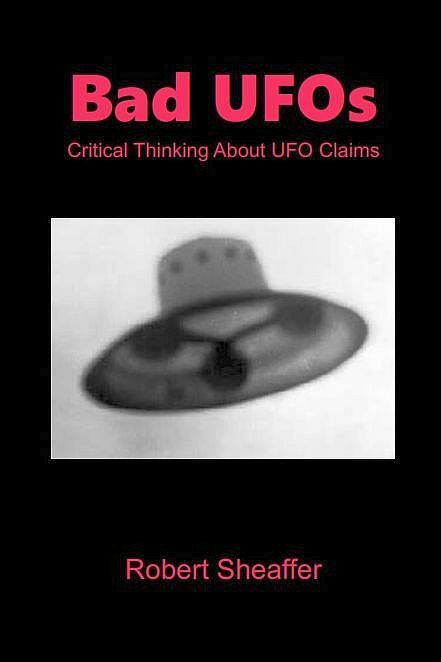 "
UFO proponents, however, generally settle on just one interpretation and actively avoid all other possibilities, much less make any attempt to rule them out. In a ridiculous number of cases, their interpretation requires traits never demonstrated and frequently defying physics. Since we've already mentioned the Phoenix Lights, recognize that a number of witnesses saying they saw a boomerang shape against the night sky not only trumps (to proponents) a larger number of witnesses saying that it was a flight of aircraft, but also makes the huge leap to this being extraterrestrial in nature. No mention of how they ruled out all mundane possibilities, nor how an eyewitness statement could possibly demonstrate that something originated off planet. Not even the recognition that the 'value' of eyewitness statements is logically trashed by conflicting statements. "If I chop down a tree..." So, in your example, you're relying on first-hand, eyewitnesss testimony/experience. So do many UFO experients and proponents. "I was abducted by aliens; I have all the evidence of extraterrestrial visitation I need." Why should they listen to anyone else's "incorrect interpretations"? Also, let's be honest: Many UFO skeptics are all too eager to seize on a single, convenient interpretation when dismissing an alleged UFO incident. I'm not arguing for the reality of extraterrestrial visitations of Earth. I'm also not rejecting all the points you've made. I'm just interested generally in the ways the UFO issue is argued, and who is privileged to define what constitutes "correct" and "incorrect" interpretations of the UFO phenomenon. Ross: " 'If I chop down a tree...' So, in your example, you're relying on first-hand, eyewitnesss testimony/experience. So do many UFO experients and proponents. I'll give you fair warning: I'm distinctly impatient with attempts at disingenuous manipulation, and will very bluntly call out anyone on it. I feel quite comfortable saying that we've established the existence of trees quite well, and in case you missed it, it was the existence of the chopped down tree that served as the evidence, not my personal account. So you're not arguing any case here. "Also, let's be honest: Many UFO skeptics are all too eager to seize on a single, convenient interpretation when dismissing an alleged UFO incident." Sure, let's be perfectly honest. Every last UFO account exists because it describes something out of the ordinary. Without even any demonstration of ET life or non-inertial aircraft, the probability of someone seeing such is quite a bit lower than the probability of them seeing (for instance) common military aircraft; commensurately, they are beholden to establish just how far out of the ordinary their encounter is. There is no 'equal footing' for explanations between aliens and ordinary military craft (or whatever,) no matter how frequently this type of misdirection is used in UFO circles. I hate to belabor the points about how bad humans are at perception, nor how popular (and lucrative) amazing stories are, thus boosting the incentive to simply lie, but anyone who dismisses such factors is demonstrating far more bias than those who routinely consider them. So, is it logical for a skeptic to dismiss a UFO account? That depends on whether your standard is absolute proof of what someone actually saw, or just the failure to establish that the encounter was extraordinary and/or accurate. But let me put it this way: suppose any encounter is factual? Suppose the Phoenix Lights were actually (an) alien craft? What then? What difference does this make to the scientific community, to our knowledge base, to space exploration, to anything? Well, what I personally would take from it is, part one, a boomerang shape. Wow! Part two, that while possessing some huge aircraft with radar-evasion, the aliens were stupid enough to decorate their craft with strings of lights and appear during a period where ten times as many humans were watching the skies. There's no part three, because I can find nothing else to deduce. Not a long research paper. So even super-generously giving the benefit of the doubt accomplishes bupkiss. "I'm just interested generally in the ways the UFO issue is argued, and who is privileged to define what constitutes 'correct' and 'incorrect' interpretations of the UFO phenomenon." I have no idea where you got the idea of 'privilege' from, but see my warning above. Nor does the term 'correct' have any bearing, but try both 'probability' and 'objectivity' instead. Anyone is welcome to come to the conclusions they like, as much as I am welcome to disagree and point out the problems with their conclusions. I have yet to see any skeptic derive some kind of privilege from this, so what makes you think this is a competition? The mere existence of the chopped-down tree would not be sufficient evidence to prove that you chopped down the tree, because you are not the only person capable of chopping down a tree. There would have to be additional evidence linking you to the chopping down of the tree. You know that you (not someone else) chopped down the tree because of your first-hand experience of doing so (in your fictional scenario). Of course, as you point out, alleged "aliens" aren't the equivalent of trees, the existence of which is well-established. I don't for a moment think that the Phoenix Lights were (an) alien spacecraft. If they were proven to be so, though, I think it would be a big deal. Knowledge of an alien presence on Earth would have a profound psychological impact on humans. That's why we bother to research and argue, pro and con, the UFO question. I used the term "correct" because you made reference to people incorrectly interpreting phenomena. Incorrect interpretations imply, logically, the existence (or possibility) of correct interpretations. "Objectivity" is a fine ideal, but difficult to achieve in practice. Ross, I think it's accurate to say that most of the folks commenting on these pages would be rather pleased if aliens found some way to get here. I think it would be great to meet with someone (or -thing) completely different and talk about philosophy, technology, etc. Unfortunately, certain physical laws make it immensely unlikely this will ever happen. In a similar fashion, our scientific knowledge makes the existence of Sasquatch, Nessie, and chupacabras vastly improbable. What the skeptics are saying, ultimately, is that they've seen a thousand pictures of lights in the sky and heard countless witness accounts of something beyond the norm; more of the same gets us no further. What we need is an alien or an alien ship. Eyewitness testimony is great in the case of the tree being cut down. We can see the tree on the ground, and there are marks on the tree stump from a saw. We know other trees have been cut down by saws, so it's just a matter of who did it. When it comes to flying saucers, however, we have nothing. It's no better than a hypothetical exercise to use eyewitness statements about something never proven to exist. Proving that these things are impossible is very difficult, but showing how close to impossible they are is a reasonable effort. "alleged 'aliens' aren't the equivalent of trees, the existence of which is well-established." You don't need to "explain" the skeptics' position to me. I'm very familiar with it. I didn't just fall off the cosmic turnip truck, m'boy. And don't take me for a "believer"; I'm not. I'm skeptical of both believers and skeptics. Ross, only the first sentence was meant to address your post. I used it as a jumping-off point on objectivity, and that skeptics are open-minded even while engaged in the cynical task of debunking the paranormal. The remainder was for a more general audience. Although I only recently came upon this blog, I've read through most of the past comments, so I am pretty much up on who stands where. I'm sorry I wasn't more clear. For the record, it was a turnip wagon. Google "turnip truck" and you'll find that it wasn't a mistake on my part. Also, beware of uncritical generalizations (or idealizations) like "skeptics are open-minded." A lot of them aren't. Welcome to this blog. If you just fell off the turnip wagon, you picked an interesting place to do it. And that, my friends, is how real science is done. Presumably the 3 MJ-12 documents Friedman endorses are the ones that he, Moore and Shandera released in 1987 (for which Friedman did a lot of the research). The 97 or so phony ones are the later ones that he had no involvement with. A case of bolstering one's own research, perhaps? So Alain Boudier suggests that the atomic bomb was reverse-engineered from captured alien technology. He also accepts Roswell as an true alien craft. But one of the Roswell ET proponents' main theses is that the USAF has been secretly reverse-engineering this craft ever since (thus accounting for the big official cover-up). But we now know, from Mr Boudier, that the USAF had been engaged in reversing alien technology even before Roswell occurred! Moreover, some of the very guys that took part in the recovery at Roswell (such as Marcel) had already, unknowingly, taken part in the Hiroshima/Nagasaki atomic bomb drops, which were based on technology gained from examining material from earlier UFO crashes in 1941 and '42! My question: Why have the US technologists been so slow (65 years so far) at reverse-engineering the Roswell craft when they managed to do the same for the earlier crashed UFOs within a mere 3 years? Maybe Mr Friedman can suggest an answer. Phoenix Lights?...Hell, after all these years, I'm still waiting for the Escondido, CA lights. Yes, anecdotal to be sure, but after all these years peering into the night skies of SoCal, not one thing of interest to report...not even a "runaway" drone!.